October 9, 2017 By This post may contain affiliate links. 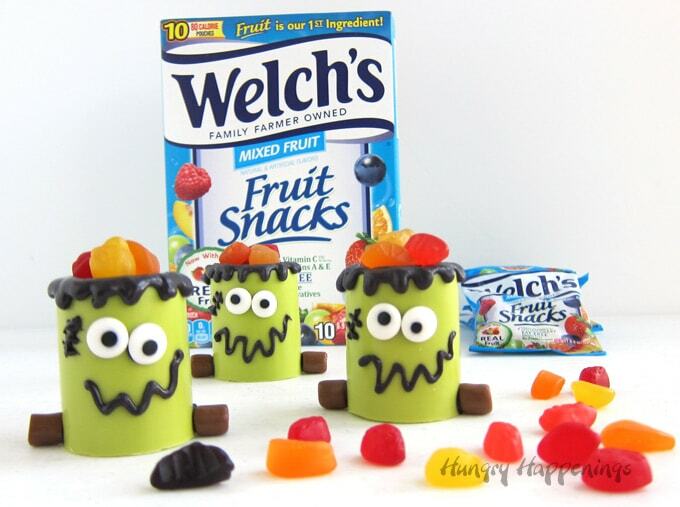 Fill Frankenstein Snack Cups with Welch’s Fruit Snacks for a fun Halloween treat. 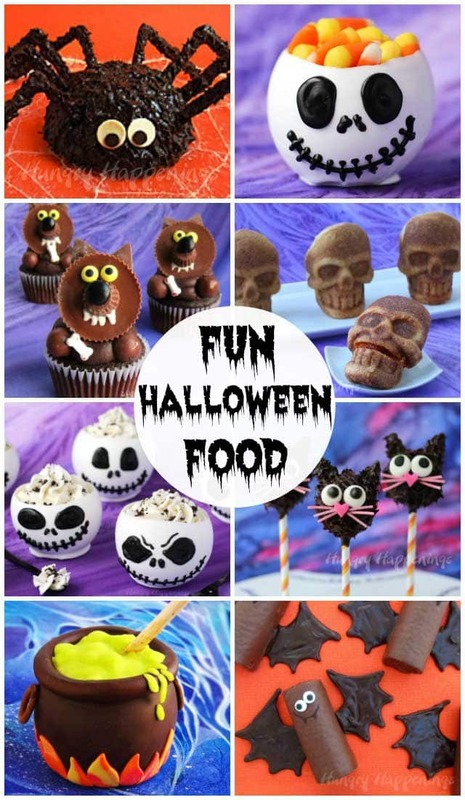 I am so excited to share this fun Halloween snack with you today. Not only do I love how these Frankenstein Snack Cups turned out, but I am also a huge fan of the Welch’s Fruit Snacks I put inside. I’ve been snacking on them since I was young. They were my go to snack when I got my first office job. In mid-afternoon I’d just reach into my desk drawer and grab a pouch of Welch’s Fruit Snacks. I like that Welch’s® Fruit Snacks have fruit as their first ingredient, have 100% of the daily value of Vitamin C and 25% daily value of Vitamins A & E. Plus they taste great. I still carry them with me in my swim bag for a tasty after-work-out snack. So when I created these cute Frankenstein Snack Cups I decided to fill them with these colorful little treats. One pouch of the Welch’s Mixed Fruit Fruit Snacks fills each cup perfectly. 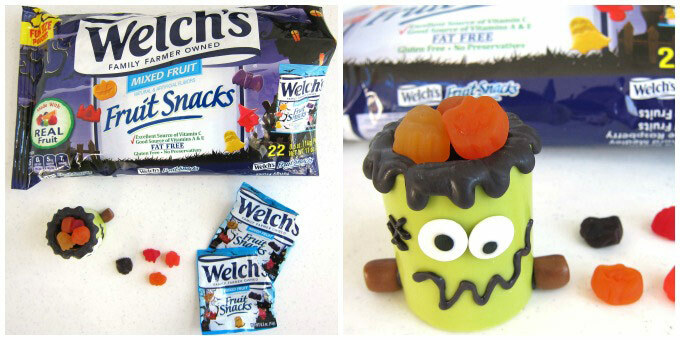 If you prefer, you can fill your Frankenstein Snack Cups with Halloween Welch’s Fruit Snacks. Welch’s has cute pumpkins, ghosts, bats, haunted houses, and witches in their Halloween mix. The orange, red, purple, and yellow colored fruit snacks look great inside the cups. These festively shaped fruit snacks would also make great snacks for your trick-or-treaters at the door or for celebrations before your kids head out for the big night. I will be passing them out to some of the kids who knock on my door this year. I’ll also be serving Welch’s Fruit Snacks to my party guests in these Frankenstein Snack Cups. I know the kids and adults are going to love them. To make these perfectly shaped, easy-to-make, snack cups you will need a silicone shot glass mold. 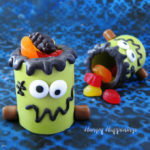 I showed you how to create Zombie Candy Cups earlier this week and making the Frankenstein’s Monster is just as easy. Watch this video to see how you can quickly make and decorate your own Frankenstein Snack Cups filled with Welch’s Fruit Snacks. It’s best to pop the snack cups in the freezer to allow the black hair to harden before decorating further. Don’t allow your snack cups to sit in the freezer for more than about 15 minutes otherwise they can get sticky. You can, if you prefer, just use a plastic cup as a mold like I did when I made my Santa Suit Candy Cups. I have a video tutorial showing you how to use that method too. You can find Welch’s Fruit Snacks at your grocery or discount store. Click here to learn more and save! 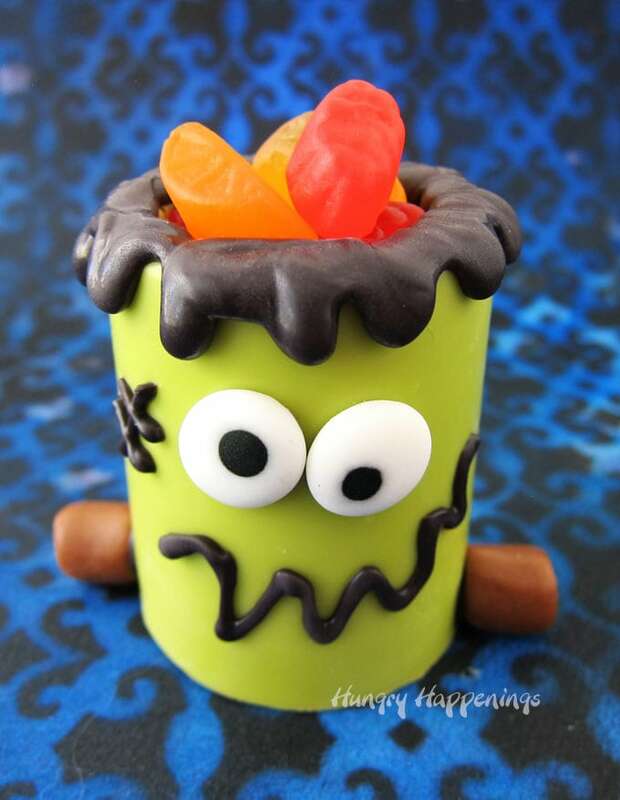 Snack cups decorated like Frankenstein's Monster filled with Welch's Fruit Snacks make a fun Halloween treat. Pour the melted green candy into a disposable pastry bag. Pipe the candy into 8 cavities of a silicone shot glass mold. Tap the mold to remove air bubbles. Freeze for 10-12 minutes until the candy hardens. Remove and push snack cups out of the mold. Set aside for 10 minutes so the candy comes to room temperature. Pour black candy melts into a disposable pastry bag. 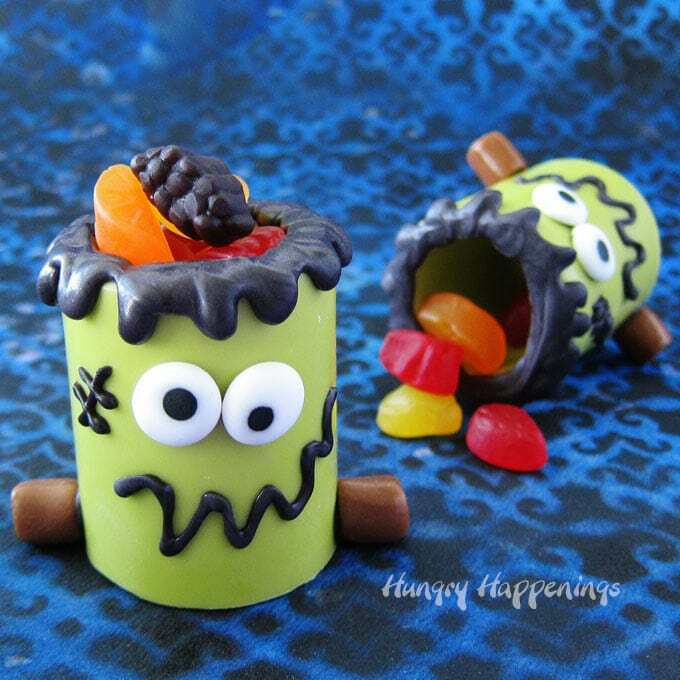 Pipe dribbles of candy over the top edge of the snack cups forming the monster's black hair. Use the black candy to attach two candy eyes to each snack cup just under the black hair. Attach two chocolate fudge rolls on either side of the snack cups, placing them near the bottom edge. Pipe on a scar using black candy. Freeze for 3 minutes until the candy hardens. Fill with Welch's Fruit Snacks. If you make these Frankenstein Snack Cups and share them online be sure to mention Hungry Happenings and link back to this post. Use the hashtag #hungryhappenings on social media and tag @hungryhappenings. If you’d like a picture of your creation added to my Readers’ Gallery, be sure to send your picture to beth@hungryhappenings.com.